My favorite memory of this trip was the whole culture shock. Life in Kathmandu is completely different than life in Los Angeles. I enjoyed working with the nurses at the hospital and talking to the doctors. 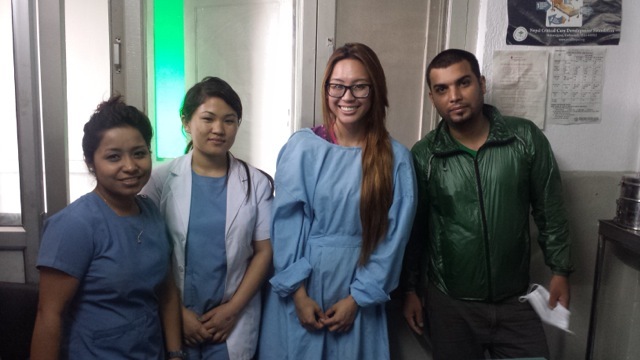 One of my most memorable moment of this trip was being able to be in the operation room, during the operation. I was actually seeing operations in person, and not behind a wall or glass window. I thought that was really cool because that does not happen often here in the states. The most difficult thing I experienced was not being able to communicate with the Nepalese people. Although some of them do speak English, I wish I knew more basic words and phrases to communicate better. Since transportation is only by bus or taxi, it would have been easier to say simple words. I wish I was better prepared for the idea that this country is definitely not like home. It did not cross my mind that there are typically no traffic rules. I forgot about the fact that there is no running hot water, and the showers are not exactly the best for your hair or skin. I did not enjoy the giant bugs flying everywhere. Tips for future volunteers would definitely be going on a weekend trip to Chitwan. I and a few other volunteers decided to go to Chitwan, the national park, for the weekend! That was definitely an amazing, unforgettable experience. Also, bring extra cash just in case you want to go on trips or do extra activities. Bring snacks, since there are only two meals a day. Definitely, go sightseeing whenever there is free time because Nepal is one of the most beautiful countries I have ever seen. The people there are beyond friendly. How was it working with the ABV US staff & also the staff in Nepal: The A Broader View staff has always been helpful. Whenever I had a question and I sent an email, the response was quick and efficient. They always answered my questions. The staff in Nepal was also amazing! They made me feel like I was at home. I enjoyed the hospitality they gave me. Yes, I am willing to speak to other volunteers. During my trip to Nepal, I was extremely hesitant at first because I am going to a foreign country on my own. A Broader View made me feel extremely safe and prepared me to go on this amazing journey I was about to experience. The hospital staff I was able to work with taught me so many things, and I observed more than I expected too. I definitely had an unforgettable learning experience at the hospital. The free time to sightsee Nepal was a definite plus, because this country is so beautiful, and the people there made it more welcoming. 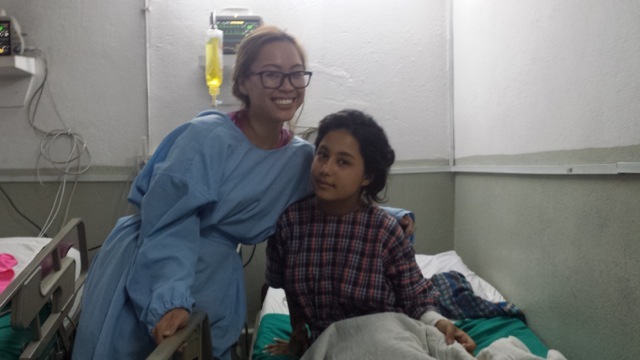 I have nothing but positive things to say about my experience in the pre-med/pre-nursing program in Nepal.